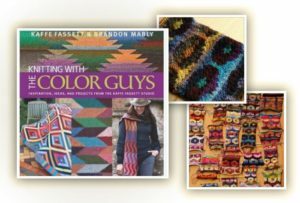 Enjoy a one-day creative knitting workshop, incorporating Intarsia and Fairisle techniques, with Brandon Mably from the Kaffe Fassett Design Studio. This workshop is for knitters who are interested in sharpening their colour observation in design. Participants should know how to knit and purl – only the basic stocking stitch will be used in the workshop. This one-day creative knitting workshop, led by Brandon Mably from the Kaffe Fassett Design Studio, will incorporate Intarsia and Fairisle techniques to help knitters sharpen their colour observation in design, by working with a range of light and dark colours in contrasting tones. It’s designed to give you the confidence to use your own personal colour scheme in future designs. Brandon will introduce the Persian Poppy design – otherwise known as the Magic Ball, and then give students a basic graph from which to work. He’ll demonstrate carrying yarn in Fairisle and Intarsia knitting then will work with students as they apply the technique to their own knitting. Attention will be paid to colour, texture, pattern, working on a swatch using at least 12 colours, and in the afternoon Brandon will critique everyone’s work – he promises in a very positive way! Scissors and Knitting needles – whichever size is most comfortable for the student, suggest a range of UK 6 or US 8. At least 20 colors of yarns in small quantities (Bring min. 10 light or bright colors and 10 dark or deeper colors in lots of in small quantities (golf ball size windings) in either a DK weight or 4 ply. Remember – the more colours to play with, the easier it will be for you to make substitutions and choices. Notebook and camera are optional. Coffee and tea will be available from 9.30am onwards until the class commences. You will have an opportunity to look around our Warehouse and purchase supplies prior to the class, during and even afterwards. Workshops and events must be paid for in full at time of booking. If you are unable to attend an event or workshop that you have booked, a refund will only be offered if 21 days’ notice is given prior to the event. Refund given will be the full amount less £5.00 administrative cost for each workshop or event cancelled. Sometimes due to circumstances beyond our control workshops and events may be cancelled. We cannot be held liable for any travel costs incurred. However, a full refund will be processed for the workshop. We will give you as much notice as possible should we need to cancel a class or event.